cPanel is a very popular Linux hosting control panel, used not only by hosting providers but also enterprise and goverment bodies. For large scale hosting environments hosting mission critical databases, how do you integrate cPanel with a high availability database? 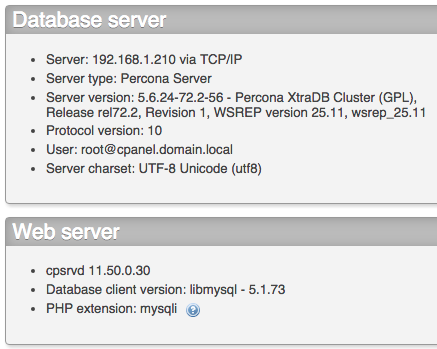 In this blog post, we will show you how to integrate Percona XtraDB Cluster into cPanel to provide a high availability database hosting solution. 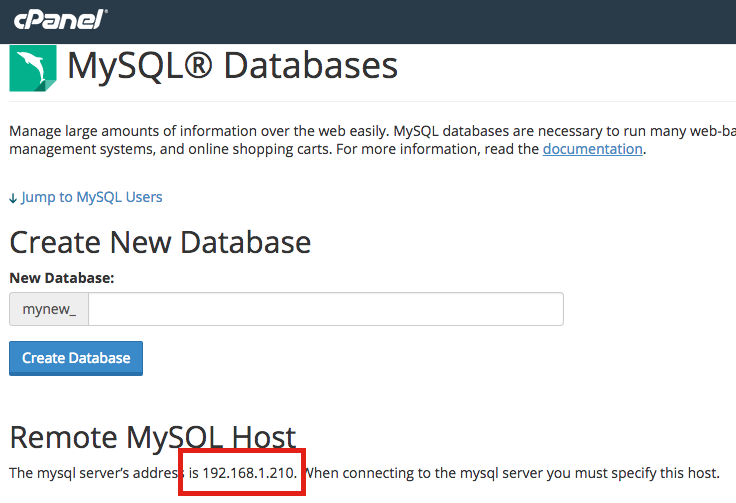 By default, cPanel uses localhost to host the MySQL databases created by cPanel users. It is not uncommon to find MySQL to be the culprit when it comes to overloading the server. By having a remote MySQL server or cluster, we can offload some of the burden and increase the availability of other important services on the server. skip-name-resolve must be turned OFF, as some cPanel services authenticate through hostname. Setting up correct host definitions in /etc/hosts is vital. MySQL tables should only use InnoDB. Some application installers like cpAddons (Site Software) and Softaculous create MyISAM tables in MySQL. These features should be used with extra precaution. The network infrastructure must support multicast or unicast to allow floating virtual IP address. 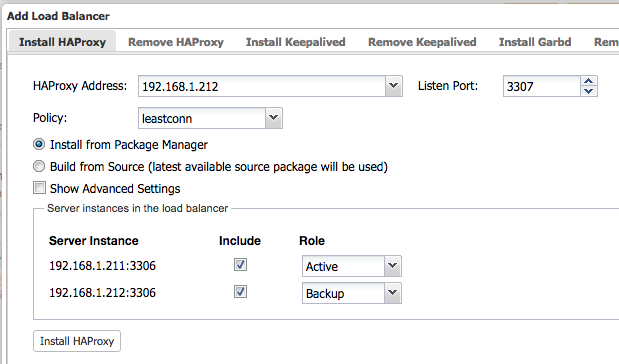 This provides a single access point that can failover between load balancers. 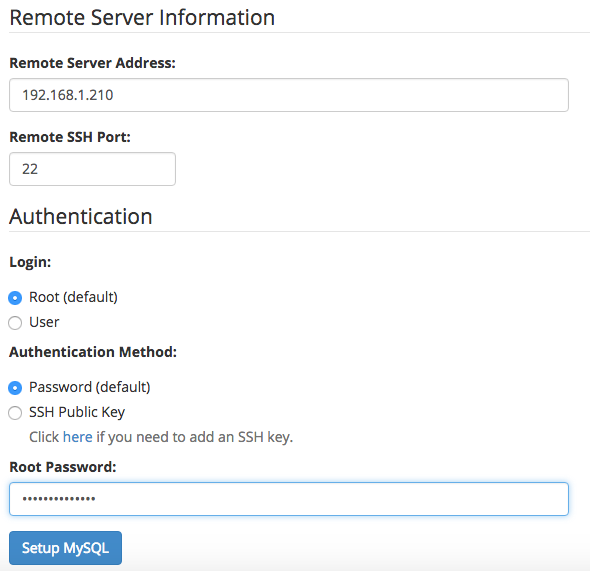 Before you set up a remote MySQL server, ensure that the remote server is able to resolve your local server's hostname to its IP address. To confirm this, log into the remote server via SSH and use the host command. MySQL and Perl must already be installed on the remote server. You must be able to connect via SSH from this server’s IP address to the remote server. Storage engine must be InnoDB only. Otherwise, the cluster might crash. All tables must have a primary key defined. Comply to Galera cluster limitations as described here. It’s preferable to let load balancers redirect queries to a single node, to reduce the chance of deadlocks and make it more predictable. Take note that if you can’t meet the mentioned requirements, then this would be a risky attempt. WHM will then connect through a virtual IP address floating on galera1 and galera2. This provides failover in case one of the DB nodes goes down. This setup allows only one node to be down at one particular time. Follow the wizard, a deployment package will be generated and emailed to you. 5. The database cluster deployment will take about 15 minutes, and once completed, the ClusterControl UI is accessible at https://192.168.1.215/clustercontrol. Enter the default admin email address and password on the welcome page and you should be redirected to the ClusterControl UI dashboard. 6. It is recommended to run Galera on at least three nodes. So, install garbd, a lightweight arbitrator daemon for Galera on the ClusterControl node from the ClusterControl UI. Go to Manage > Load Balancer > Install Garbd > choose the ClusterControl node IP address from the dropdown > Install Garbd. 1. 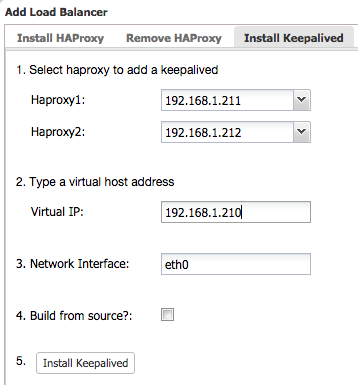 Deploy HAProxy on mysql1, 192.168.1.211. 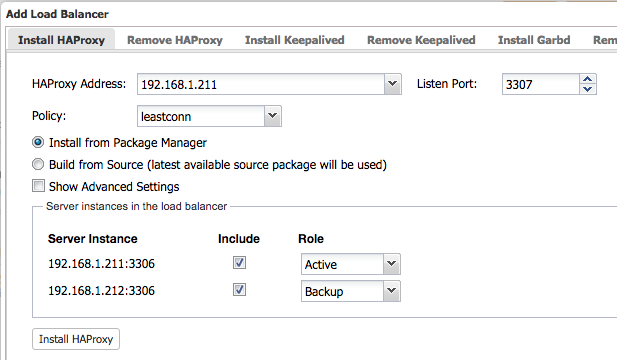 Go to ClusterControl > Manage > Load Balancer > Install HAProxy and include both MySQL nodes into the load balancing set with Active/Backup role. The green line indicates the MySQL server is up and active. All database requests through this HAProxy instance, port 3307 will be forwarded to mysql1 (192.168.1.211) unless it’s down, where mysql2 (192.168.1.212) will take over the active role. This means, we are not implementing multi-master writes in this setup. Now we are ready to integrate Galera Cluster into WHM/cPanel under Setup Remote MySQL Server feature. We will use the virtual IP address specified above as the remote MySQL endpoint for WHM/cPanel. **Replace [mysql root password] with the respective value. 4. Now it’s safe to shutdown the local MySQL. Go to WHM > Service Configuration > Service Manager and uncheck the ‘Enabled’ and ‘Monitor’ tickboxes for MySQL Server. 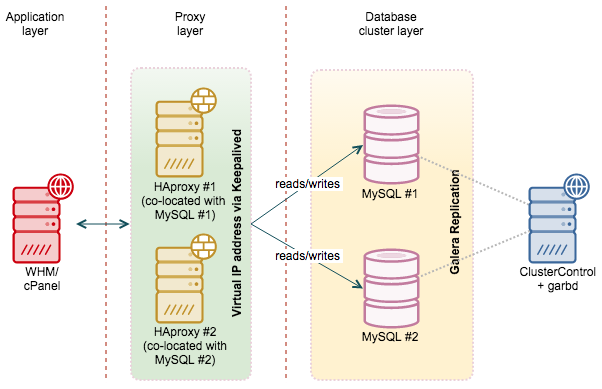 From this point, MySQL databases will be hosted on a high availability Galera Cluster with auto failover. So, make sure you specify the highlighted host when connecting to the MySQL server from the application/client side. The setup is now complete. As a hoster, it is likely you will enable cPaddons or some third-party application installer like Fantastico or Softaculous to automate the installation of web applications from cPanel. Some of the applications still explicitly define MyISAM as the storage engine in the SQL files. MyISAM support in Galera is experimental, we would not recommend you run MyISAM tables in your production Galera Cluster. You can also use the mentioned command for other application installer. In case you upgrade cPanel or the installers, please make sure the engine has not been reverted back to MyISAM. That’s all folks!